10am I’m reading about the big buzz created around the recently published NY Times article “In India, Fashion Has Become A Nationalist Cause”. It amazes me to see how people can easily weave in politics and religion into anything and everything that has the potential to cause national uproar. 11:30am I’m still pondering over my question when Nasreen, our maid walks into the room. Nasreen has been helping me with household chores ever since her alcoholic husband decided to give her Talaq. Today, she has this ear to ear smile on her face; something typical of her whenever she had something interesting and expensive to show me. I’m waiting for the surprise to come out from behind her and I’m completely bowled when I see it. Sensing the confusion in my eyes, Nasreen explains that the sari was gifted to her by another lady for whom she worked since they had a marriage function going on at their place. Feeling guilty for spoiling her excitement, I try to fake a look of excitement on my face. Satisfied to receive the kind of response she had wanted to get from me, Nasreen looks happier and leaves the room to continue with her chores. My thoughts return back to the NY Times article. What must have instigated the writer to come up with the notion that Banarasi sarees are adorned by only Hindu ladies? It is the richness of the silk by which these sarees are made that makes them especially appealing to ladies regardless of whether they are Hindu, Muslim, Sikh or any other religion. I’m sure it would look as appealing to a Hindu lady living in India as it would to a Christian American lady visiting India. 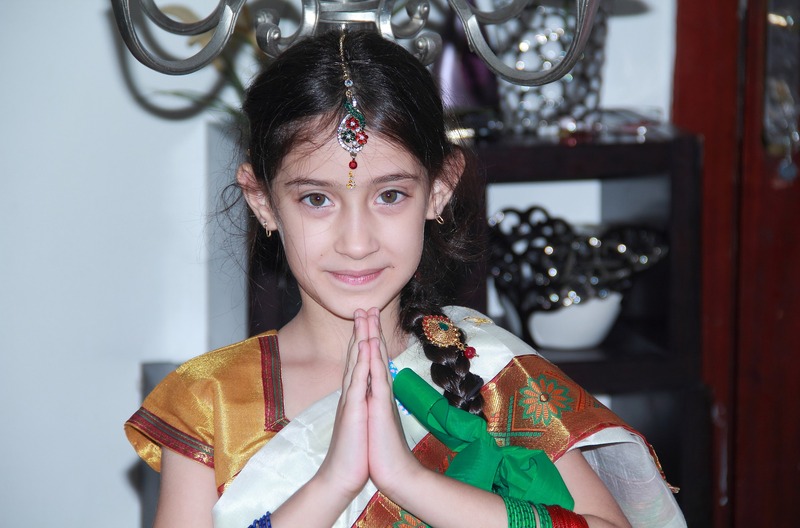 Wearing the Banarasi will not miraculously convert her into a Hindu. LOL!! Isn’t that exactly what we mean and want, when we talk about the ‘world becoming more open to cultural change’? Instead of giving a religious & political angle to the cultural heritage of a country, there is a need to promote cultural acceptance amongst people to make the world a better place. 8:00pm I need to get ready for a very close Muslim friend’s wedding and I’m browsing through my wardrobe to choose something to suit the occasion. My attention is caught by the bright yellow Banarasi sari peeping out from beneath the stack of silk sarees and instantly a smile appears on my face.